A Case of the Runs: PSA: Glass Tupperware is Life-Changing! 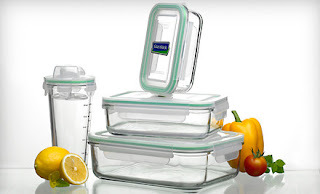 I recently Tweeted about my love for glass tupperware (or food storage-ware, to be more correct). I've been using these regularly for at least a year now, and I will never go back to plastic!! I might be sounding over-enthusiastic or preachy, but these are things that I use all the time due to storing leftovers and packing lunch for myself and "The Ukrainian." - Hygiene: Glass isn't porous like plastic, so tomato sauce will not embed in it and cause you to scrub; plus, smells (e.g., tuna, garlic, etc.) don't get trapped in there, ever! The amount of time I've saved from scrubbing tupperware is already enough for me to sing praises about these. Everything just slides off! - Cost: I bought a set, similar to the one below, at Bed Bath and Beyond for $19.99, plus got 20% off with a coupon. I have not bought any more tupperware since then, and the cut-down on washing time/detergent might help off-set the cost.... So although it seems like a lot upfront, it is totally worth the few extra bucks, in my opinion. - Heating/Cooling: I personally find that they heat food much more evenly than plastic (be sure to remove the lids). Plus, there is no transfer of weird odors or tastes into your food. I don't own a microwave, but I do use one at work, and they have yet to break on me in there (I try to be conservative about microwave times, though!). Also, if it's a cold food item, I find that the glass retains the cool temperature pretty well. The only con I can really think of is a little extra weight... but honestly, you won't even notice it after a while. Also, kids might need to get used to these, and they aren't "cute." Now onto your regularly-scheduled blogging! Awesome! I've been making the switch piece by piece but need to break down and just get a set already. Those look really nice. I should invest in some good quality tupperware. I think that is probably a wise investment. Thanks for the review! Hmmm, I never thought of glass before. Is that awful?